Although my gardens that I have been working in all summer have been blooming abundantly, it occurred to me that I haven’t written about them or posted photos. How remiss of me! So here is a recap of what has happened this growing season. 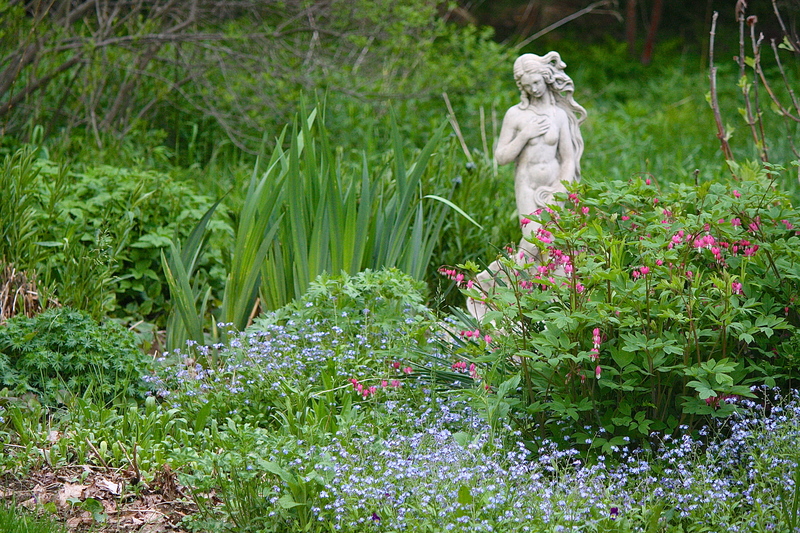 A statue of Botticelli’s Venus, the Roman goddess of Love, overlooks a Bleeding Heart (Dicentra spectabilis) and Forget-me-nots (Myosotis sylvatica). Molto romantico! 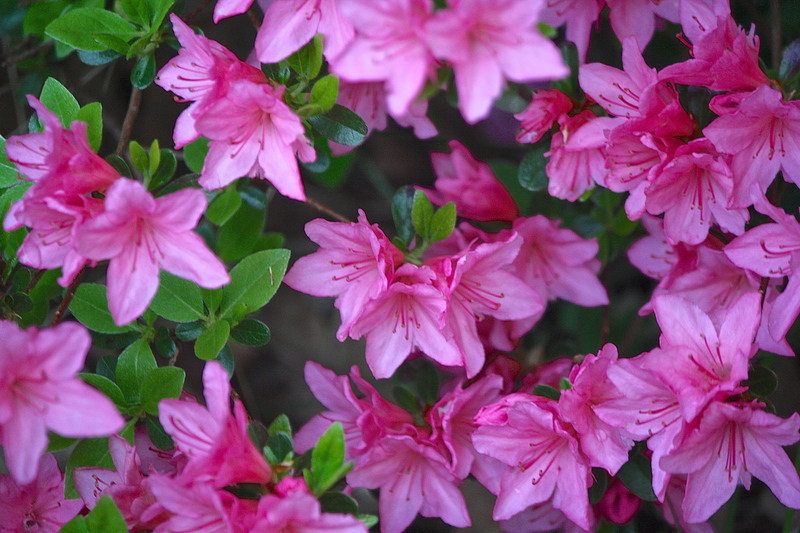 Below, this pink Azalea (Rhododendron sp.) on the west side of the house bloomed like crazy. Such a cheerful pink and the bumble bees loved it. A few weeks later: Blue Star (Amsonia tabernaemontana), Yellow Iris (Iris pseudacorus) and Geranium ‘Johnson’s Blue’ and G. sanguineum have started blooming. The garden is filling in. By the front steps, a small garden with a pond and fountain (good feng shui!) planted with Corkscrew Rush (Juncus effusus), Pickerelweed (Pontederia cordata), Taro (Colocasia esculenta ‘Black Magic’) and Waterlilies (Nymphaea sp.) is a haven for frogs. Two more types of Geranium (G. sanguineum var. lancastriense and G. x cantabrigiense) flank Crested Iris (I. cristata) and English Thyme (Thymus vulgaris). Lavender (Lavendula angustifolia) and Speedwell (Veronica incana) are just behind the Geraniums. Fothergilla (F. gardenii), Japanese Iris (I. ensata), Ostrich Fern (Matteuccia struthiopteris) and Common Geraniums (Pelargonium cv.) are in the background. July is when the wild meadow flowers really get going. 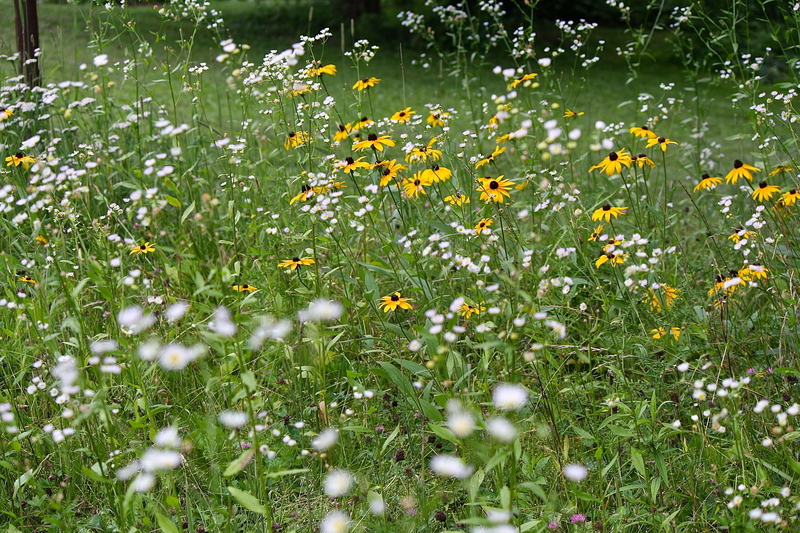 Below are Daisy Fleabane (Erigeron annuus), which I love for its sweet, honeyed fragrance and looking somewhat like an airy Baby’s Breath, Black-eyed Susan (Rudbeckia hirta) and Yarrow (Achillea millefolium). Red Clover (Trifolium pratense) and Oxeye Daisy (Leucanthemum vulgare) have already gone by. 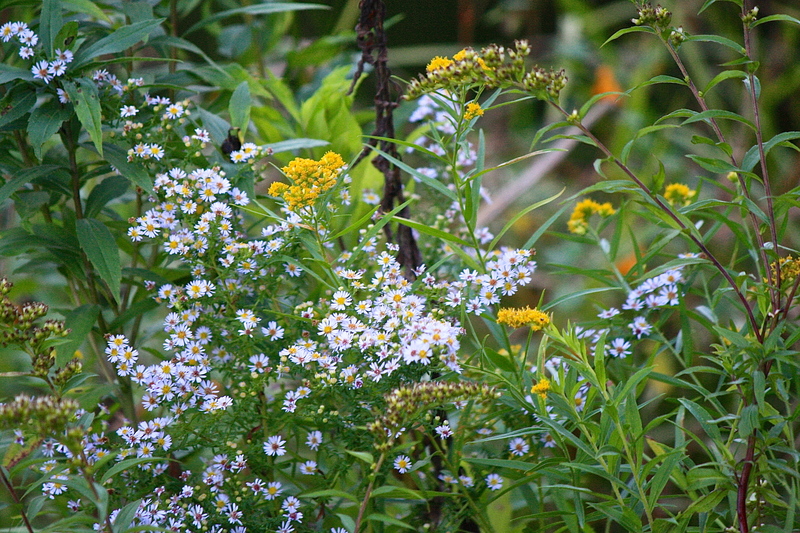 The pollinators love these plants! Because this area is not mowed, it is teeming with life compared to the lawn in the background. Spiders, insects, frogs, toads, snakes and rodents create a natural ecology. I mow the fields in the late fall or early spring when all is dormant to keep the habitat open and free of trees and shrubs, which would move in within a few years. 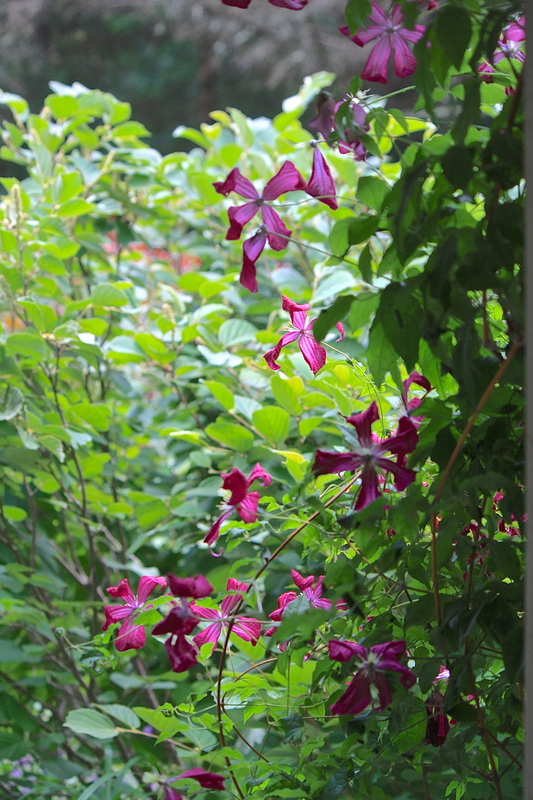 Another July event is the blooming of Clematis ‘Amanda Marie’ next to the front porch. With its outstanding color, a vibrant deep-red, almost burgundy, it performs well year after year with only a quick trim in early spring and a bit of compost. Here’s the largest garden in the backyard at the beginning of August. Since we eat three meals a day seated on the deck (weather permitting), I try to make this vibrant all summer long. The highlights are flaming orange-red Crocosmia ‘Lucifer’, Coneflower (Echinacea purpurea), Yellow Daylily (Hemerocallis ‘Hyperion’) and self-sown white Flowering Tobacco (Nicotiana alata). 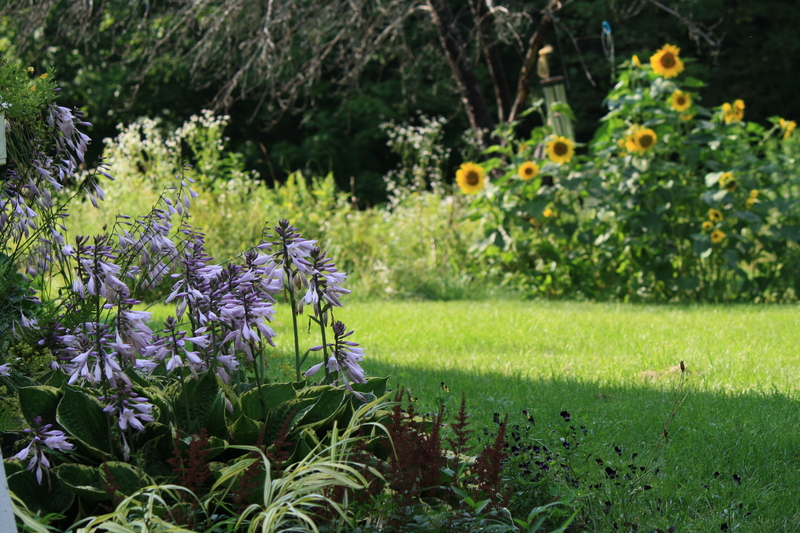 Out of sight, pink, purple and white Cleome (C. hassleriana) and Sunflowers (Helianthus annuus) add height and color to the back. 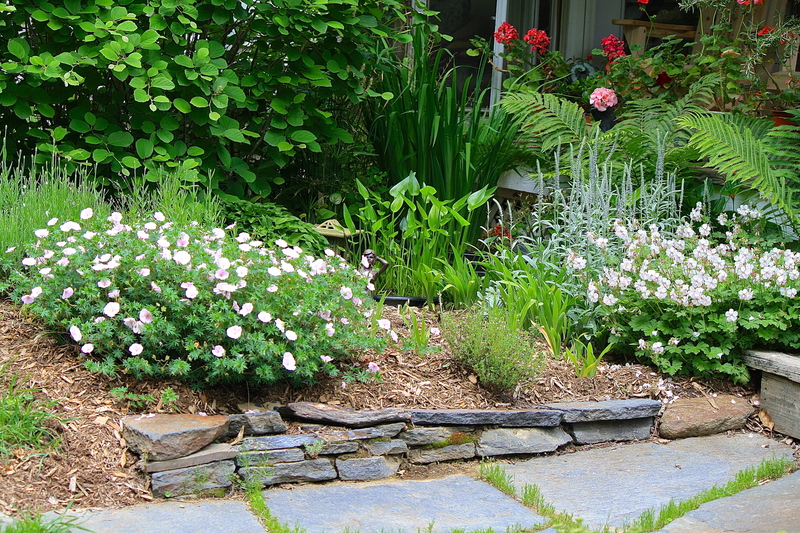 White and pink Phlox (P. paniculata) and New England Aster (Symphyotrichum novae-angliae) will follow shortly. 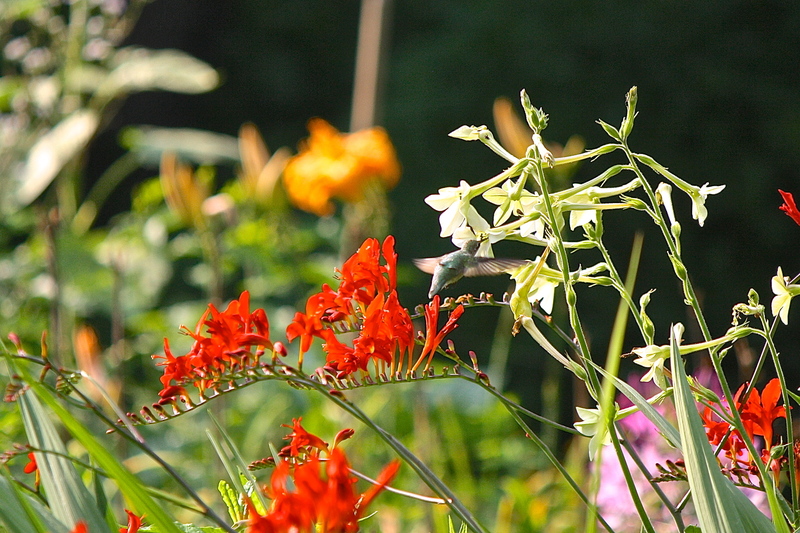 Below is a close-up of a hummingbird visiting the Nicotiana and Crocosmia. 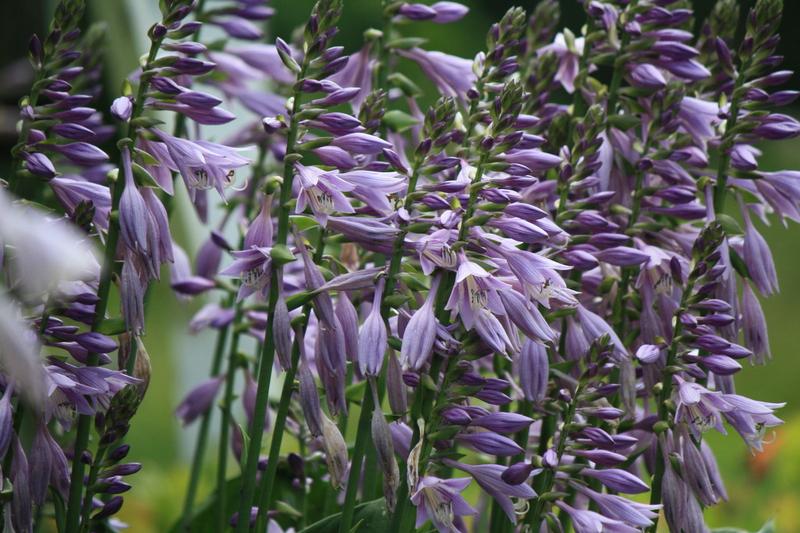 I have to include photos of the purple Hosta flowers with the golden sunflowers in the background. The birds love these sunflowers and eat them as soon as they are ripe. 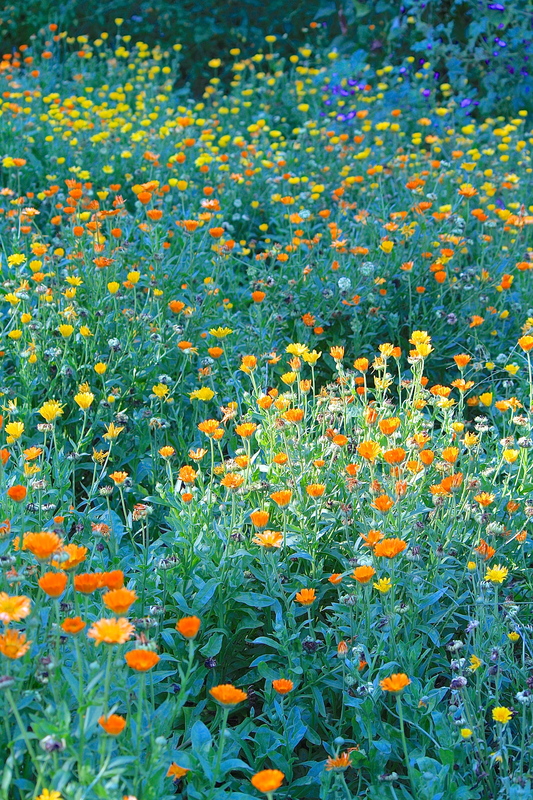 The annuals are an explosion of color and the delight of the garden these days. Purple Mealy-cup Sage (Salvia farinacea), vibrant Petunia ‘Purple Wave’ and golden Pot Marigold (Calendula officinalis) provide a grand finale for the end of the garden season. 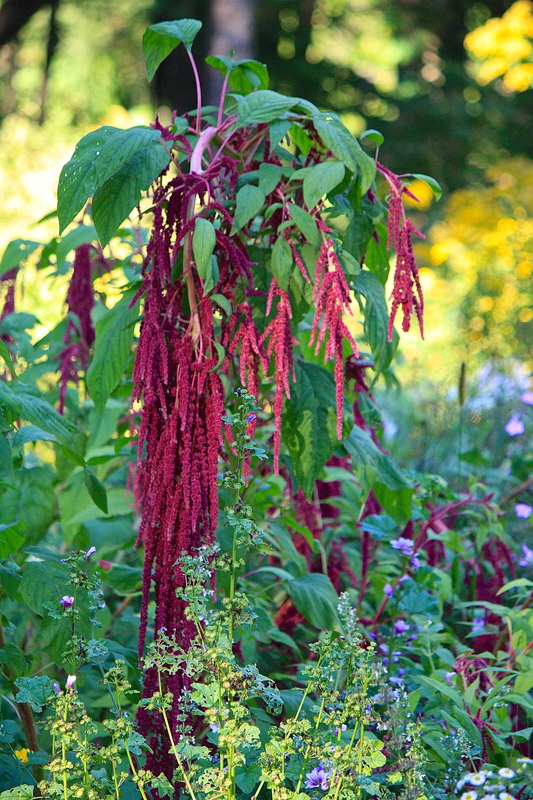 Love-lies-bleeding (Amaranthus caudatus) is a marvelous annual with its pendulous flowers looking like burgundy dreadlocks! Goldenrod in the background provides a nice contrast. Calendulas self-sow every year, taking over large areas of the garden, which I don’t mind at all – they are breath-taking to behold! Another self-sowing annual, purple Morning Glory (Ipomoea purpurea) is in the background. Although we still have perhaps a month to go before frosts completely diminish the garden, the plants are winding down; with their seed set, their mission is fulfilled. 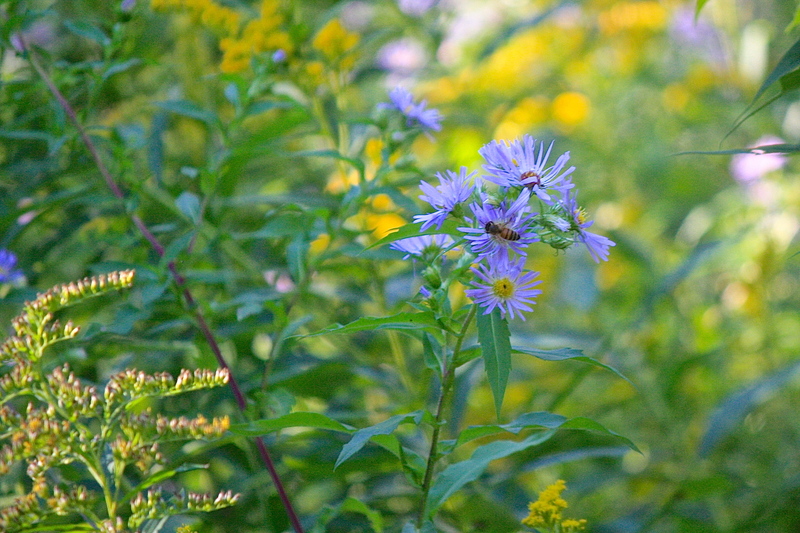 In the fields, the last wands of the goldenrod intermingle with New York, Heart-leaved and Calico Asters (Symphyotrichum novi-belgii, S. cordifolium & S. laterifolium, respectively) weaving a beautiful tapestry of gold, lavender, purple and white. The bees, wasps, butterflies along with a few other insects dance among the blooms, storing for the winter ahead or completing their life cycles after ensuring their next generation will emerge in the coming spring. Crickets sing all day long, a background sound that I love and will miss when it no longer accompanies me at my work or as I drift off to sleep at night. Such are the seasons; I must not resist the tide of time, but instead embrace and accept with gratitude the beauty of each and every new day. This entry was posted in Country Gardening, My Photos and tagged country gardening, flowers, gardens, Horticulture, perennials, photography, summer. Bookmark the permalink. So much beauty Eliza! Thanks for sharing with us. Wonderful. So lovely. Thank you. 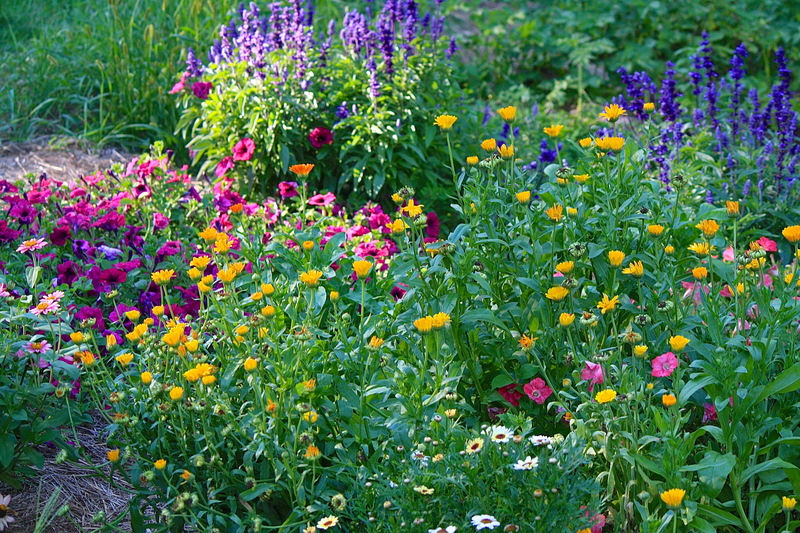 Your garden is a bouquet that lasts for months! How fortunate for all the little animals who live there! It is a wonder that you do any blogging at all. I’d be hard pressed to go indoors with so much beauty to enjoy. Your last line about acceptance and gratitude is a sweet & wise. Thanks Eliza. Thank you, Micheal. It is hard not to be outside all the time, esp. when I know the warm days are numbered! Last night it was 45, today’s high was 58 and tonight will probably be even colder. My petunias don’t look so good anymore. 😦 Que sera, sera. Yesterday 104, today 102, tomorrow 100. We’ve been cooking all summer. Soon it will cool down here too, I hope. I’m surprised that the plants don’t seem to mind as long as we replenish their water. Too bad I can’t send you some of my cool air and you can’t send some of your heat – at least it is a dry heat, if it was humid, it would be unbearable. Fall is coming! Aw, thanks so much, Ihsan. So nice to see your smiling face – thanks for visiting! Wow….what a gorgeous view of the seasons. A feast for the eyes! Your gardens are breath-taking! Thanks for sharing. Thank you, Ellen, so kind of you to share that! Beautiful photos, it just makes you feel connected and grateful. That is it exactly, Karen. I do feel connected and always grateful! Thanks for stopping by. Beautiful! Great verity and colors .Thank you for sharing. Thanks so much, I’m glad you liked your visit! Oh my goodness, Eliza! OUTSTANDING!! Really. To achieve a stunning garden throughout the gardening year is a mark of a truly expert gardener. I need to go back and study each photograph for pointers on how to improve my own garden. I could not possibly choose which seasonal view of your garden I like best. FABULOSO!!!!!!!! Thank you kindly and sincerely, Barbara! So beautiful! And I know all the planning and work that went into it making it look effortless and natural. Beauty beyond beauty like you! Beautiful garden Eliza. Truly inspiring! Oh, what a great idea! This post made me happy for the changing of the seasons. Nicely done, Eliza! 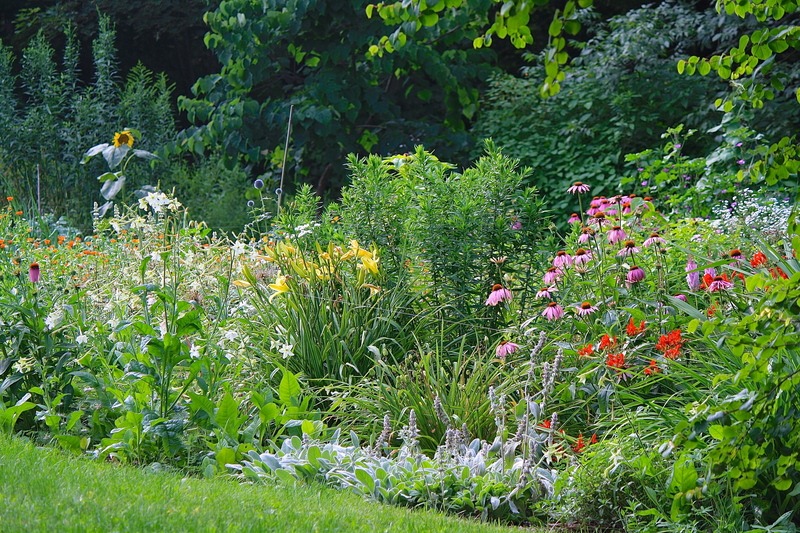 Your garden is gorgeous in all seasons. Thank you, Fi. Do you garden much? Thanks, calendula is a good astringent tea, but I find it tastes like broccoli -lol! It has to be masked with mint or lemon balm. I do dry a jar full just in case I need it. It makes a pretty tea. Sounds like a great health tonic! 😀 – aye, I guess I am! Your gardens are beautiful. I especially like that you leave the goldenrod in. Its such a beautiful flower. The gardens show your loving care. Thanks for sharing. I really like these. The May and June pictures especially; instead of ‘Venus Rising from the Waves’ you have captured ‘Venus Sinking into the Flowers’- which I think is at least as beautiful! Your garden is wonderful! Such an inspiration for the seasons … and perfect for bees! Thanks, Val, for your kinds words. Bees in the garden are such a wonderful sound. Sometimes I stand in the garden, close my eyes and simply listen to the gentle hum. Delightful! Beautiful gardens! You are ambitious! And a great gardener! Beautiful gardens! You are ambitious! And a great gardener! You inspire me for the summer that I am anticipating already! LOL There is a prediction that our Wisconsin winter is going to be even more bitterly cold than last winter…not looking forward to it! Oh – this is spectacular. Your gardens are just fabulous, Eliza. You are so talented. What a beautiful place you’ve created – yes, three meals a day outside. I just love all the flowers and wildlife…….very very wonderful. Thank you for sharing your world. You have a beautiful garden Eliza, just lovely. Thanks so much Karen. I can’t wait to see the daffodils again! Hi Eliza, it’s me! It was the “love-lies-bleeding” which stuck in my memory. I’m ready to order some seeds soon. How do you like this plant all in all? I liked it a lot, such an unusual plant. 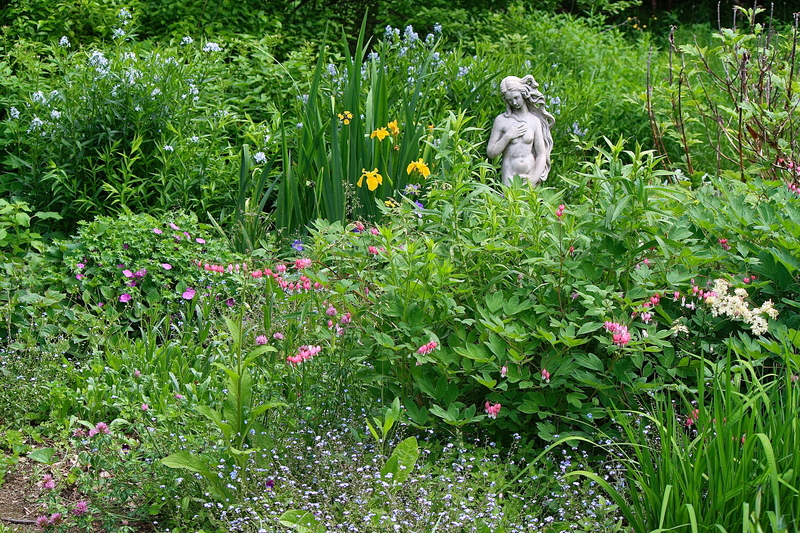 It is rather large and gangly, each plant needs at least 2′ square space. Well suited to back of the border, perhaps with a large-flowered pink dahlia in front to complement its burgundy. You can eat the thinnings like spinach, I’ve read, but should be cooked, not raw, because of the oxalic acid. Very lovely indeed. How I wish I could visit your garden! You’re surrounded by such beauty Eliza…simply stunning!! Thank you, Storm. I love the immersion this time of year! Precioso jardin , Eliza, el amor por las plantas y el color es universal, gracias por compartir. Si, es universal. Muchas gracias!